Dillon is an armadillo ranger in the Old West. The local towns fallen under attack by the Grocks, lumbering rock monsters that are trying to steal all the pigs from each town. 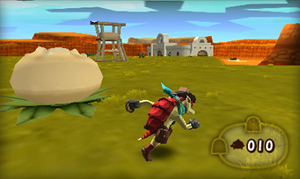 As Dillon, you must collect materials to strengthen the towns' defenses, then head into the fray, destroying Grocks using Dillon's rolling attack. If Grocks pass close to your defense towers, they will be hurt or destroyed. Stop the Grocks from stealing the pigs in each town to progress to the next town.